Even if you never buy a keyboard or other midi device you can enjoy Atari 8bit game networking using either the forthcoming 1088XLD Atari 8bit based computer, or using the SIO2MIDI board on any Atari 8bit computer with at least 64K of memory and the XE Super Cart 128 - MidiMaze. Enjoy game networking with upto 16 Atari 8 bit computers connected. The cartridge pcb comes in three versions, bare pcb, pcb populated with all parts except the eprom containing the program and fully populated pcb. Only the eprom will be socketed, all other parts will be soldered directly to the board. Currently I am offering the pcb in two formats, the gray XE Super Cartridge case(Bug Hunt) or the Atari Brown Cartridge(Atari Basic) case. A nice peel off Midi-Maze label (Designed by legeek of AtariAge.com fame) will be provided for your cartridge case. You will need to supply the cartridge case. Initial offering will be via pre-order. At least ten of each format will need to be sold in order to make. Initial offering will take about 2-3 weeks for assembly and testing before shipping once the minimum is reached. Any other items purchased at the same time will be held until the pcb is ready for shipping to save you on shipping costs. In the US shipping is $8.00. International shipping will be more. Please goto my site XE Super Cart 128 Midi-Maze PCB, register if you haven't already and place and pay for your order. Edited by Dropcheck, Sun Mar 24, 2019 6:30 PM. I'm definitely interested. Is Jürgen going to offer these too? Could you please test the PCB's with the XE computers? I've already got three MIDI-Maze cartridges from another source, but on an XE I have to wiggle them up and down to make them work. No problem on an XL. BTW will the PCB's fit inside that other grey cartridge case (the ribbed ones)? I will be checking with Jurgen. I think he will if it's a bare pcb. I checked my test board with 2 different 130XE's and one had no problem (I don't normally use it, it was in the closet) and the other did seem to have problems. That said that one has been a bit flaky with other cartridge pcbs too. I would try another 130XE to see if it's an issue with the cartridge port rather than the cartridges. Just a clarification on the peel and stick label. I will be offering the matching case label for all fully populated pcbs ordered only. 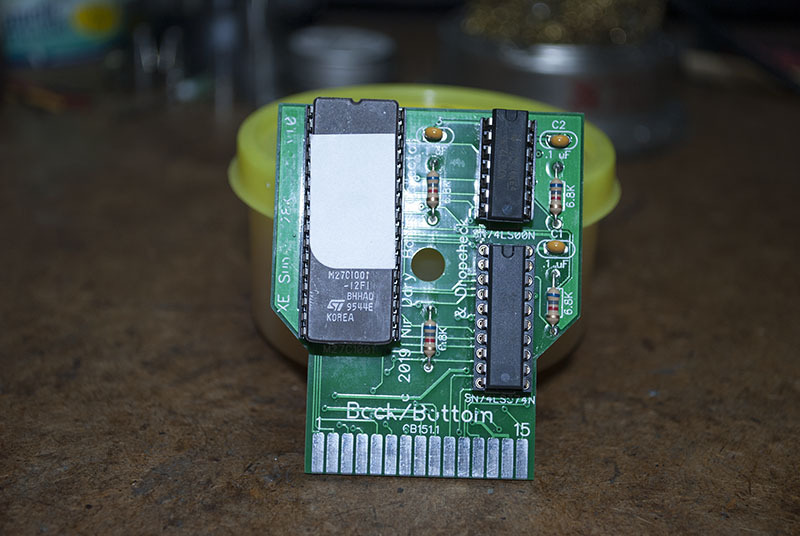 If you chose to go sans eprom or bare pcb then I will post the appropriate graphics file in the documents section of the product page along with the BOM. Not sure if you meant you checked on another 130XE or not. I don't know what to say other than my test pcb was rock solid on a XE machine I don't normally use very often and had problems on a machine I know to be finicky with other cartridge devices. I consider it a wear issue on the cartridge port of the one XE. My XL (bog standard and 256K versions) had no issues, but that is a vertical insert force rather than a horizontal one. So it maybe a weight issue on a horizontal plane? There could be other issues with the one 130XE, but cartridge port wear and horizontal plane weight issues would be the most likely. I can't tell from the outside shell what the inside looks like. Does someone have an inside view? If your cartridge external is the only difference between the two types of grey XE cartridges then you should be good to go. The Bug Hunt cartridge I linked to is the only grey cartridge I have to do measurements and fit tests with. 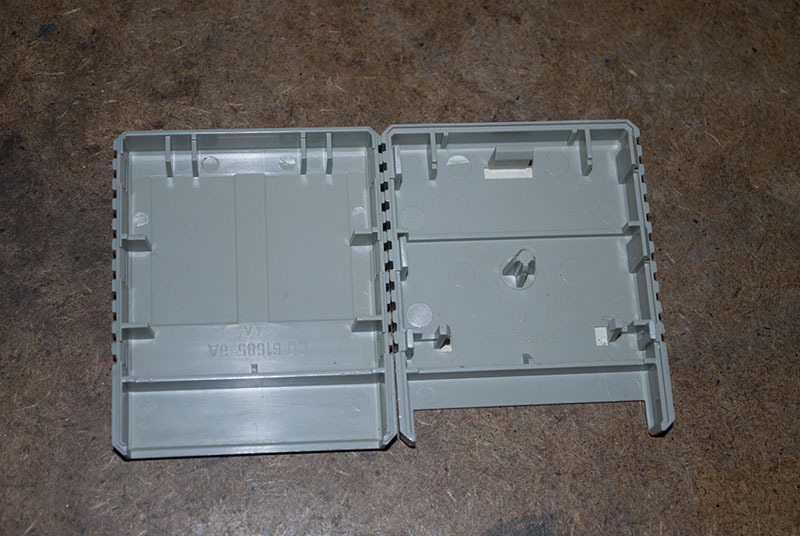 This is the image of the inside of the grey ribbed XE cart I designed for. 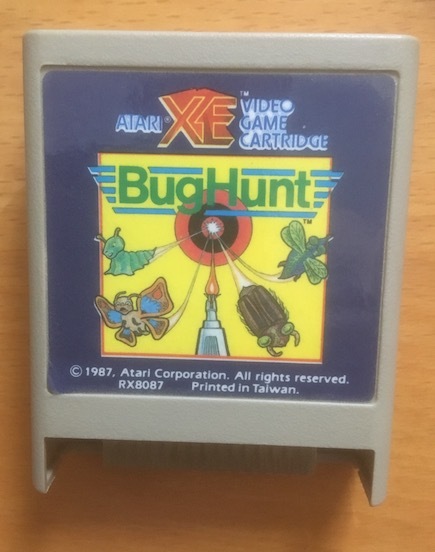 What I meant was that when I red "BugHunt Cartridge" in your first post in this topic, I immediately checked my BugHunt cartridge to see which kind of cartridge that was. My MIDI-Mate cartridges are all of the ribbed kind. Since my BugHunt cartridge is NOT of the ribbed kind and I didn't know that Atari also sold BugHunt in a ribbed cartridge, I asked if you PCB would also fit inside the ribbed cartridge case. But since the BugHunt cartridge you showed is of the ribbed kind, your PCB should fit. BTW why not include the case label for one or two USD extra? Since I'm not sure on how many XE's I've tried my MIDI-Maze cartridges (and to make sure it wasn't just one), I'll try my MIDI-Maze cartridges on a couple of XE's soon (if I don't forget). PS the picture in your posting above (#7) doesn't show up. Loading it separately tells me your site can not be found. Edited by Mathy, Mon Mar 25, 2019 1:52 PM. Where we can get the sio2midi device? There is a long thread I tried to follow regarding a midi device but at the end they centered in the 1088xel and not in a regular original atari SIO device, so I got lost. Are you planning to sell the PCB for a midi compatible SIO device (that works with midimaze)? those sio midi devices will also work with midi music sioftware and keyboards and drums? As you can see I am lost. Click on the SIO2Midi link in the first post text. It should take you to mytek's site. It's setup right now as a DIY project with gerbers and BOM. Currently I'm not offering that as assembled device, but I think MacRorie is planning on doing that. I do include a case label for those who purchase the fully populated pcb. I'll be posting in the document section of the product page both kinds of labels for all the other versions of pcb. Jurgen is indicating that he will produce upto a fully populated pcb for those in Europe. He may or may not be willing to produce a label. Can you click on the link in my signature line and bring up my site okay? This persistent issue only seems to be happening for those in Europe. At least I'm only get complaints from European users. If others are getting this please report the web browser/version, whether this is happening only at home or at work/mobile connection. Obviously there is some kind of mismatch, but it remains a mystery why the difference right now depends on US vs European access. The picture of the inside of the ribbed cart is visible now. I'm following this topic, so I get a message when something new is posted here. I clicked on the link to read the first new posting and when I scrolled up the picture was there. Could this have anything to do with the time of day/different time zones? Looks like your DNS is borked. Edited by ivop, Tue Mar 26, 2019 10:32 AM. But are you talking about images in my posts here on AtariAge or access to my site? Both. Once your images don't show up on AA, your whole site is not accessible. Sometimes I get SERVFAIL (there's no DNS server for your domain) from nslookup, but mostly NXDOMAIN (the DNS server is there, but it doesn't know bitsofthepast.com). It's not an issue with DNS proper or no one in the US could access my site. I couldn't access it either. I'm not getting reports from people in the US. There's something wrong with the DNS resolution between the US and Europe. Can you try a different internet service provider to see if you can reach my site, say a cell phone that can do web site access? Make sure it's not trying to use your home/business internet service provider through your wireless rtr. Edited by Dropcheck, Tue Mar 26, 2019 12:01 PM. At the moment it works, but next time it happens I'll try my mobile internet (not wifi) to see if it has the same problems or not. Should be routed trough different networks (Ziggo and T-Mobile). I could not not see Dropcheck's site or pics for a long time. I came home today and I can see everything now. Just placed an order. Got word back from the tech guys in charge of the server, that they found a problem and fixed it. They say it could take upto 48 hrs for the DNS to straighten out. Well for your punishment you have to build me three MidiMaze carts. . Order sent. No worries. Just as long as the problem gets fixed. No need to apologize. (curious) Was it because of the NS vs WHOIS mismatch? I guess I'll have to take that punishment. Makes you wonder how long they've been messing up... I remember when I ordered a year or two or so back... I'd think they'd owe you money... half migration is a terrible thing. Not checking their work... well that's another... mumbling and making such statements, well, that's just unprofessional. I think we need to put anti gremlin devices around the ranch. And a cyber patrol on the wan connections just to be sure. The good news is... it's fixed. Well, fingers crossed the devices and patrol deployed in time, and the mumblers did their job correctly for once. Edited by _The Doctor__, Tue Mar 26, 2019 10:05 PM.